Ponta Delgada Port on São Miguel, the biggest island of the Azores, is a busy place. This is true also in terms of foreign tourists and local visitors. Beautiful is the view from the pier from one of the sidewalk cafes. On first sight, it is a surprise that a wader comes very close even to busy tourist infrastructure. 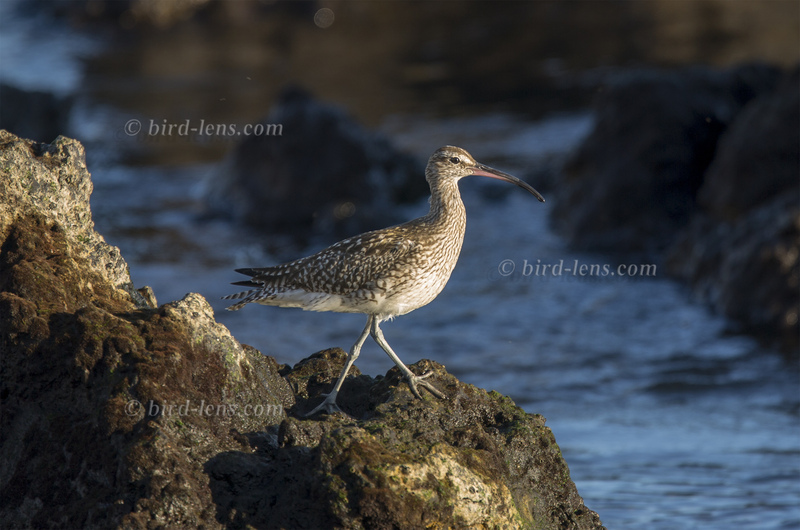 But the Whimbrel (Numenius phaeopus) is searching for food on the rocks of the wavebreakers. The Whimbrel is a regular migrating bird on the Azores, which can be observed on all the islands of the Azores at any time of the year. The Whimbrel is one of the largest waders that occur in the archipelago. Something smaller than the Eurasian Curlew (Numenius arquata), the bird has shorter legs, as well as a shorter, less decurved bill. Anyway the bill recedes still visibly down. The general tone of the plumage is brown, the belly is whitish. The most obvious character is it well-marked eyebrow (by comparison with the Eurasian Curlew, a bird with which it is sometimes confused, despite its larger size); the legs and toes are greyish. In flight it is usually easy to identify, due to its characteristic silhouette, the white rump with the shape of an “arrowhead”. Over the roaring sea of the Azores you will probably not hear the sonorous vocalizations the bird emits. This is a migratory species wintering on coasts in Africa, South America, south Asia into Australasia and southern North America. It is also a coastal bird during migration. The Whimbrel has a clear preference for the rocky coastal zones – where is plenty on the Azores. Having said this, it might occur in islets, beaches, ports, marinas and pastures, where they are sometimes observed to feed between the seagulls, the Yellow-legged Gull of the Azorean race (Larus michahellis atlantis). The special thrill for birdwatchers on the Azores is the fact, that you might find a Hudsonian Curlew. N. p. hudsonicus breed in the Hudson Bay area to northeastern Canada and might be trifted by heavy winds far to the east. Morphologically both subspecies are “equal” and with a very similar plumage, although the general tone of the plumage of the north-american counterpart is a more yellowish brown. Standing still its identification can cause some trouble, immediately dispelling any doubt with the bird in flight, because the American subspecies does not present white on the back. Instead is shows an uniform brown. The Azores in general have a great potential for birdwatching, especially for American migratory birds, including passerines of several habitats. Habitats include lagoons, streams, woods, coastal areas, small pastures and agricultural fields. This wide variety of habitats allows the observation of an interesting range of resident and migratory birds.